Another group of high-speed tropical sportfish, mackerel tuna and longtail tuna are prolific in offshore waters and often venture into our estuaries. Longtails can be seen in large schools feeding actively on the surface in areas close to shore and in the open sea and mackerel tuna are usually found several kilometres from the coast. Fish are taken by sight-casting lures to the school or trolling round it. 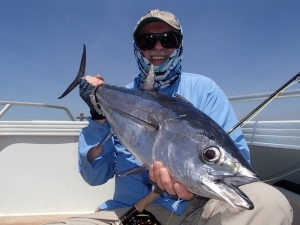 Northern Territory tuna usually weigh between 2-4 kg and, when hooked, stubborn, fast runs can be expected before they are subdued. Season: Most tuna are taken during the tropical dry season. Method: High-speed threadline or overhead casting outfits in the 4 kg to 8 kg range. Small shinny metal lures or feather jigs which are cast or trolled at high speed around feeding schools provide best results. Eating: Longtail tuna are reasonable eating when bled and iced promptly after capture, particularly if baked. If bled at capture and held on ice for a while, both longtail meat and the darker flesh of mac tuna can be eaten raw as sashimi.